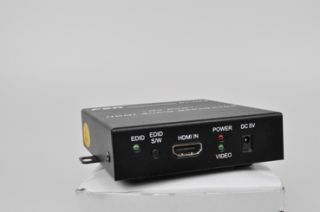 The FSR DV-HAS is an audio stripper designed to de-embed the stereo audio from an HDMI signal and provide a separate unbalanced line level stereo audio output. The audio can then be fed to external sound systems such as audio amps, audio mixers, or house sound systems. Video quality is preserved without any signal loss and the DV-HAS is HDCP (High-bandwidth Digital Content Protection) compliant. A single button press enables an EDID learning function to easily handle non-standard displays. The unit’s compact design can be quickly mounted using the integral mounting ears or placed in an equipment rack. Key features of the DV-HAS include: compact and practical design, HDCP, full compliance to HDMI standards, and video resolutions up to 1080p (1920 x1080) at 60Hz, and PC resolutions up to 1920 x 1200 at 60hz.